Jasminum molle - "Juhi" -OUT OF STOCK TILL SPRING 2019! 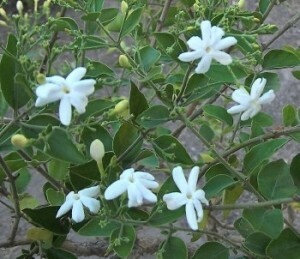 In India, the flower of Jasmine Molle or "Juhi" is held sacred to all forms of Goddess Devi and is used as sacred offerings during Hindu religious ceremonies.It is also used for making garlands and to adorn women's hair. Known as Virajaji in Telugu, it has simple ovate dark green small leaves and powdery satin white flowers that cover the plant during blooming seasons which may occur several times a year. The most profuse blooming is during hot summer months, and another may happen in Fall, and or winter. 3-4" plants.